Former President George H.W. 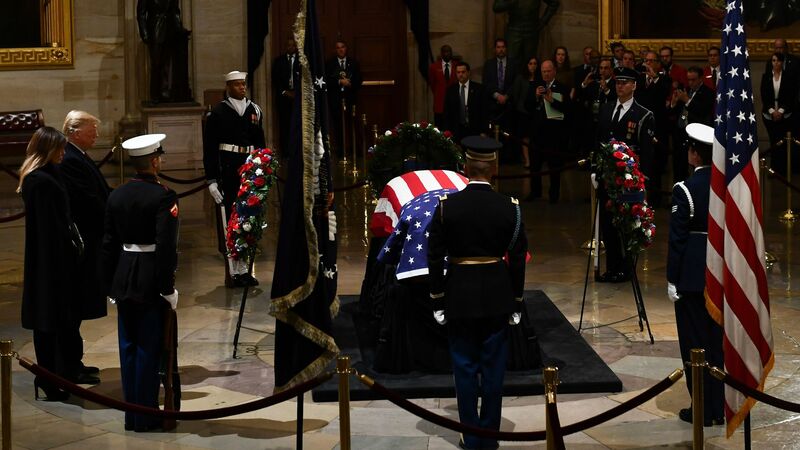 Bush has arrived at the U.S. Capitol, where he will lie in state in the rotunda until Wednesday morning. Vice President Mike Pence, Senate Majority Leader Mitch McConnell and House Speaker Paul Ryan all delivered eulogies during a Monday afternoon service in memory of the 41st president. The latest: President Trump and first lady Melania Trump went to the Capitol later Monday evening to pay respects to Bush. "He showed us that how we live is as important as what we achieve. His life was a hymn of honor. His legacy is grace perfected. His memory will belong to glory." "A steady hand, staying the course — thats what George Bush gave us for decades." "President Bush was a great leader who made a great difference in the life of this nation. But he was also just a good man, who was devoted to his wife, his family, and his friends." What’s next: Bush's memorial service will take place at the National Cathedral at 11 a.m. ET on Wednesday. He will also lie in repose at St. Martin's Episcopal Church in his hometown of Houston Wednesday evening to Thursday morning. A second memorial service will then be held at St. Martin's Episcopal Church at 11 a.m. ET. Bush will then be buried at the George H.W. Bush Presidential Library in College Station, Texas.